After working as a professional photographer, Marirose was encouraged to apply to graduate school. She graduated with International Honors from Johns Hopkins University with a Masters in Clinical Mental Health Counseling. She has always been of service to her community. Marirose worked in the inner city of Baltimore with high risk adolescents that did not have a way out of a neighborhood that is filled with drugs and violence. She counseled individual adolescent males ages twelve to eighteen. Marirose noticed that one area that was lacking was a sense of community for these boys or anyone they could go to or count on. These young boys all have experienced trauma in the form of community violence, homelessness, domestic violence and all manner of abuse. Her groups were designed to promote resiliency and offered a place for the young men to share about the violence they witnessed and/or personally experienced. She conducted group programs to build healthy bonds between the young men participating in the groups, thus giving them a sense of family and community. Marirose counseled these adolescents who all were experiencing trauma, PTSD, drug and alcohol issues, and an inability to see any future. Marirose has also taken her strength as a counselor devoted to helping create resiliency to another place that had very little hope. She worked at a men's maximum security prison where she counseled individual inmates. Some had committed and some had experienced past abuse and violence. Marirose created and led groups for inmates who suffered violence and abuse and inmates who had suffered PTSD, violence while in prison, drug addiction, and feelings of insignificance and hopelessness. The counseling focused on building a sense of resiliency. It was essential that she helped these men understand that they had value no matter where they had been or what they had done. Marirose has volunteered at St. Michael the Archangel School where she tutored low-income children, ages 6-14, assessed student performance, and provided educational, emotional, and problem-solving support to students. She also led volunteer recruitment and training. Marirose used her photography skills to raise money for the school. Marirose is committed to her community and gives back in many ways. She serves on the Core Board working against Domestic Violence and helping those that are living in a violence. Marirose assisted with the development of the domestic violence programs.The programs are designed to reach out to individuals both within and outside the community that are experiencing domestic violence. Marirose is a Board Member of glow media. Glow media creates films to educate adolescents, their families, and educators in an effort to reduce stigma, correct misconceptions and reinforce the reality that mental health affects everyone. The films deal with teens struggling with drug addiction, eating disorders, sexual identification/ orientation, and domestic violence and mental health. Marirose was the Principal in Marirose Photography she provided movie and television location and actuality services; coordinated projects with production companies; offered professional portrait photography, and special event photography. She utilized this vehicle for fundraising for nonprofit organizations through auction, premium, and promotional photography including at St. Michael the Archangel School, Neediest Kids, Traumatic Brain Injury Organization, local schools, and Wednesday's Child. 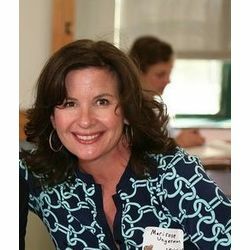 Marirose has served on planning committees for annual fundraising events for non-profit organizations including Neediest Kids, Many Hands and The Woods Academy. Her work with Many Hands included researching causes and awarding grant funding to non-profit organizations which benefited at-risk children and mothers. Marirose served in the capacities of President, Vice President, Secretary and Chair of The Woods Academy Parent Teacher Organization. She led strategic planning, budget management, fundraising and special events, in addition to establishing programs to collect new and used winter and summer clothing items which were then donated to various Montgomery County charities.